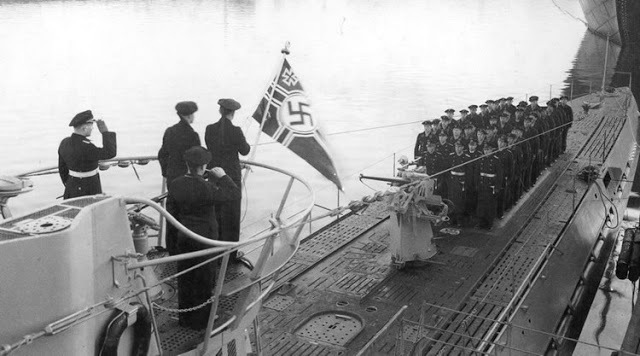 U-171 at its commissioning ceremony under Gunther Pfeffer. Günther Pfeffer, aged 27 led the next mission into the area, arriving on the Type IXC boat U-171 south of Bermuda on 13 July 1942. It was to be the boat’s first and final patrol, as it was sunk on the return voyage after 15 days in the area. From Bermuda the boat took the conventional track for the Windward Passage – a straight line to a point between Mayaguana and Providenciales, from where it transited the Caicos passage to round Inagua from the northeast. From there U-171 entered the Windward Passage on the 18th of July and exited the region. The boat proceeded to the Yucatan Channel and US Gulf where it was able to sink the Mexican tankers Oaxaca and Amatlan on the 26th of July and 4th of September. On the 13th of August it dispatched the US freighter R. M. Parker in the US Gulf for a patrol tonnage of 17,641.